Can I use 18 gauge aluminum wire, which has a min. 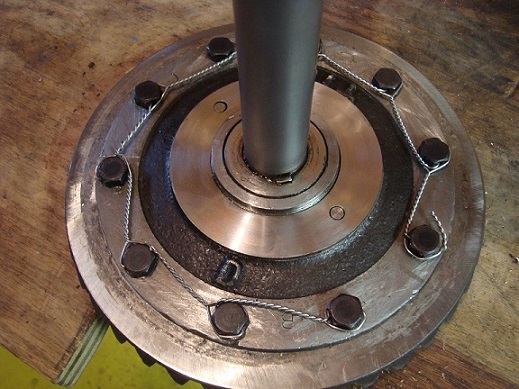 breaking strength of 30 lbs., for safety wiring the ring gear bolts? 18ga. Stainless steel would be best but many use electric fence wire. Tie the bolts in pairs. It's easier. Safety wire should be annealed stainless steel. For instance, in the magneto assembly, a non-magnetic stainless steel safety wire should be used. Such wire is readily available at any good parts store. There are special tools for performing the specific task of installing the safety wire. That is, the tool is designed to twist the wire in a uniform and consistent fashion. Using the tool results in tight and strong twists of the wire for a safe installation. It takes some practice in using the tool. I used such wire and such a tool when I assembled the differential. Any airplane mechanic would probably give you enough to do the job for free. 18 gauge is .040". If you get tie wire, it is annealed. Get some galvanized wire at the hardware store and have at. Plain steel would be better, but the galvanized usually has a better selection. If you want to do the perfect job, get a pair of aircraft safety wire pliers and some stainless wire. Practice your technique until your work looks like you would like to fly with it and then have at it. I wouldn't use that galvanized wire or any wire that sticks to a magnet. Ford used brass wire for a reason. FWIW, Harbor Freight carries stainless safety wire. Here is my theory on tightening bolts. Your mileage, practice and opinion may vary. Tighten the bolts as tight as you can get them and one more whack of the hammer on the end of the wrench. I use an 8 inch box end that I've had for 40 years or more and a two pound ball peen hammer. (MSBFH) Smack the end of the wrench until the wrench rings the same on every bolt. If the bolt breaks it is better to find out now. If it strips better to find out now. 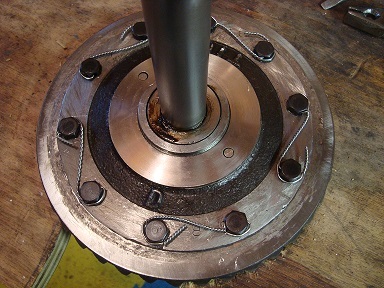 You won't strip the threads in the ring gear, it will only be the bolt threads. When they all have the same pitch when I hit the wrench with MSBFH and it won't go up any more unless I hit it with a LSBFH I run the wire through three or four bolts and bend the ends over. That keeps the loose or broken bolt in place. Wiring two together lets one flop around in there if it comes loose. It's worked in 70 Ruckstell rebuilds and a bunch of standard rear ends. Lewis Rector showed me how to do that 40 years ago when he was doing the restoration for the Towe collection. He started working in a Ford garage in Tulsa in 1915 and said that's how they did them there. Second topic. I use iron wire because it will stick to a magnet. In the filler plug there is a hollow. Put a little round magnet in that hollow when you rebuild the rear end and any little shaving, pieces of wire, etc. will stick to it and can be removed without tearing down the rear end. Might be a bad idea but that's how I do it. I won't use brass safety wire in a rear end even though I have a roll of it for that reason. Well, off to the shop, working on carburetors today. Guess all the rear ends I have taken apart, A and T (late teens up), must have been gotten to before me, they just had soft iron wire in 'em. OOPS!! Prufreed!!! Profreid!! Should have said brass or soft iron wire run all the way around. I've only seen brass in a few of them, most of them have had a piece of pretty thin iron wire. Woke me up, Mark. I GOTTA get out to the shop!!! Wasting time on the forum and Facebook, drinking coffee and eating energy bars! Bad for me! Work!!! Work!!! I wasn't pointing any fingers at anyone just stating a general observation. I have to get out to the shop too, got a rear end to tear down. And try adding water/detergent to my parts washer. "You have magnets in your differential? (The subject of this thread.)" Haha, I was thinkin' of the engine. Just finished wiring, so I hope this is the right way. Used stainless steel wire, 19 gauge. Back to the original topic, Bill, your safety wiring job looks good to me! Looks beautiful but the problem with wiring them in pairs is that if the head pops off the bolt, which is fairly common, then you have a bolt head flopping around in there. If you wire them three or four at a time on a stiff wire like mechanics wire or baling wire it will keep the bolt head -- or the bolt -- from coming loose and getting in the gears. Aircraft safety wiring is to keep bolts from coming loose. Model T differential wiring is to catch the heads or the loose bolts and keep them from getting in the gears. I'll bet everybody who has taken apart more than 25 T rear ends has found at least one with no bolt in a hole and no bolt in the case or a bolt with no head on it. Eaten up by the gears after it got loose. However, it is everybody's right and privilege to do it however they want. You do 'em your way, I'll do 'em mine. Thanks for the compliments, guys. Glad I did it right! Stan, I understand and respect your method but even if you wire them in three's or four, won't a broken bolt head on the end still flop around as it would on a wired pair? Sure the two (or one) in the middle would be safe if it broke off but I'm thinking the end ones would behave the same as a wired pair. The only way to keep a broken bolt head from falling or flopping would be to wire all ten together. That's the way Ford did it. One wire through all the bolt heads. If you wire them three and four together with stiff wire like baling wire it will probably keep it in place as the centrifugal force of the ring gear turning likely isn't enough to bend the wire. I don't care how anybody else does it but I've torn down easily over 100 rear ends and I've never seen a Ford original wire job that wasn't one wire through all the bolt heads. They used a soft iron wire, ran it through all the bolt heads and twisted the ends together between two bolts. I use either .035 mechanic's soft iron wire or John Deere American made baling wire. The reason I only run the baling wire through three or four bolt heads at a time is that it is too hard to pull through all the bolt heads. Your mileage may and probably will vary. My advice is free, based on 60 years of working on Model T's, but still free. So figure what you paid for it and take it for that. My deal is that it is yours, you can do whatever you want however you want to do it. That's how I do my work. The way I want to do it and the way it works for me. I am no longer doing Ruckstells or standard rear ends for anybody other than myself, by the way. I am pretty much out of inventory, I only have half a dozen or so rear ends on the pile and I will probably use those myself. No good auctions anymore around here with big piles of T parts like there used to be. It's abundantly clear I have WAY too much time on my hands! I really liked the way my wiring looked before, but couldn't help thinking Stan was on to something with the thread 'em all idea. So I combined the two and came out with this. If you wire them 4 at a time, I can see how a loose bolt or head in between two good bolts can't go anywhere, but what about the end bolts? Can't they come loose and flop around and get into things like if they were wired in pairs. I guess if you wire them together 4 at a time, you've cut the odds of a loose bolt by half. Maybe I'm missing something. Noel, that's why I use good old farmer type John Deere baling wire. It is so stiff, as I said above, that the centrifugal force of a bolt head or even a bolt won't make it flop around and break the wire. If I use .035 soft iron mechanics wire I just run it through the holes all the way around and twist the ends together between the first and last head. As near as I can tell that's how Ford did it. I'd post a picture of how I do it but I'm busy working on a couple carbs. I have so many photos on my puter it would take me an hour to find it. Bill, that's good except for the end two bolts. I'd have run the beginning and ending wire out in the middle space between the bolt heads, twisted it and and wired the ends together. You do have too much time on your hands but it looks nice, doesn't it? I am no expert on wiring bolts but it was explained to me by an expert that the purpose is to prevent the bolt from rotating, if the bolt can rotate half a turn before the wire becomes effective it may not be fulfilling the purpose. IE the wire should be inserted through the bolt hole in a manner that any rotation will tighten the wire and not loosen it. You are correct. I learned how to safety wire in the military using safety wire pliers that were "on the way out" and technically illegal to use. We all used them and I bought a pair for personal use about a year ago. Just did my second ring gear with them.